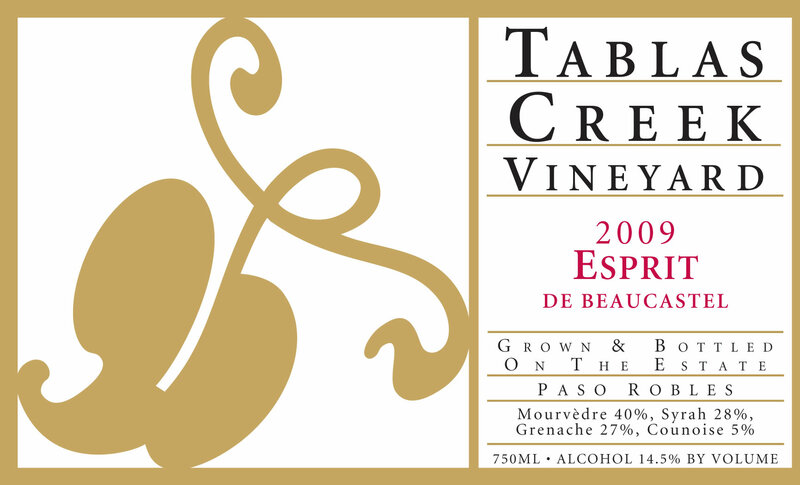 The Tablas Creek Vineyard Esprit de Beaucastel 2009 is a blend of four estate-grown varietals, propagated from budwood cuttings from the Château de Beaucastel estate. The wine is based on the dark red fruit, earth, spice and mid-palate richness of Mourvèdre, with additions of Grenache for forward fruit, approachability and lushness, Syrah for mineral, aromatics, and back-palate tannins, and Counoise for brambly spice and acidity. The 2009 Esprit de Beaucastel shows a deep, spicy nose with dark fruit, crushed rock, cocoa and licorice. The palate shows blackberry, black raspberry, and currant fruit highlighted by a persistent minerality, lush texture and substantial but fine-grained tannins. The power of the tannins and the concentration of the wine suggest that it will benefit from short- to mid-term cellaring, and drink well for two decades or more. The 2009 vintage was our third consecutive drought year, with yields further reduced by April frosts. Berries and clusters were small, with excellent concentration. Ripening over the summer was gradual and our harvest largely complete except for about half our Mourvedre at the time of a major rainstorm on October 13th. Crop sizes were 15% smaller than 2008 and 30% lower than usual. The low yields and gradual ripening resulted in wines with an appealing lushness, rich texture and wonderful chalky tannins. Syrah began the harvest of our reds between September 17th and 24th, followed by Grenache between September 26th and October 3rd, Counoise between October 10th and 12th, and Mourvèdre between September 30th and November 3rd. The grapes were fermented using native yeasts in open and closed stainless steel fermenters. After pressing, the wines were moved into barrel, blended, and aged in 1200-gallon French oak foudres before being bottled in July 2011.